Graphic design for the web refers to the process of creating digital visual media assets used on a website or other digital platform. The graphics may be used to enhance or enable the representation of an idea or a feeling in order to reach a virtual or in-person audience. Graphic design services for the web may be used for everything from enhancing the appearance of web pages to serving as the presentation and user interaction layer for dynamic and data rich web applications. Graphic design for your website is performed by a graphic designer and implemented into your digital medium by a web design expert or digital marketer. The main job of a graphic designer is to design visual elements for the web or for print that convey a message, emotion, or move viewers to take a specific action. All of these purposes can be achieved with graphical layouts for websites, posters, brochures, flyers, advertisements, social media graphics, and much much more. The goal of a digital graphic can also be as simple as catching someone’s attention, or it could aim at making them interested in purchasing a new product, clicking a link on a website, or performing a specific conversion action such as signing up for a newsletter or sharing a link on social media. At All in Web Pro we provide every kind of digital graphic design service that your business or brand might need, among the other services we offer. We are focused on providing the best graphic design services for your brand in digital and print formats, as well as web design services. Our custom graphic design solutions cater to businesses of all sizes, no matter if you need a website layout, logo design, custom letterhead, flyers, business cards, outdoor banners, billboards, or even car wraps. 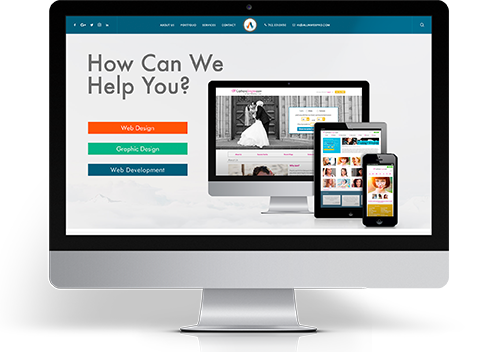 All in Web Pro is a graphic design and custom web development company based in Las Vegas, Nevada. We know that well designed graphics can be the key element that makes your brand stand out online and grab your users’ attention, and are critically important since every design has the potential to serve a valuable and specific purpose for your brand.